Rarely has an election has been as much about a single individual as it is in the 2014 election. Barring a few states, the entire country is divided into Modi lovers and Modi haters. Its all about this one man. My stand on Modi is this: I believe he is responsible for the Gujarat riots. He could have saved many lives. He did not. There are many who believe that since the Supreme Court has absolved him of any wrongdoing, we cannot really hold him responsible for the riots. I do not believe that to be true. Courts absolving someone of a crime means that there is no evidence that he was guilty. It does not mean that he is not guilty. Now, despite that, if you still want to vote for Modi, it is entirely up to you. I have no problem with that. If you believe that Modi is a strong leader, capable of giving this country a strong and efficient administration which would be in stark contrast to the incumbent government, go ahead and vote for him. My problem is with people who say that he is not guilty for the riots. Its like they don't want to say they've voted for someone who was responsible for the Gujarat massacre but they badly want to vote for Modi so, they like to believe he is not responsible. Of course, there's a loony fringe in the country who want to vote for Modi because they believe he allowed the riots to happen. I really have no comment to make about them. To the former, I would like to draw your attention to this video from a press conference in Gujarat after the riots. It is of the then Prime Minister Atal Bihari Vajpayee. 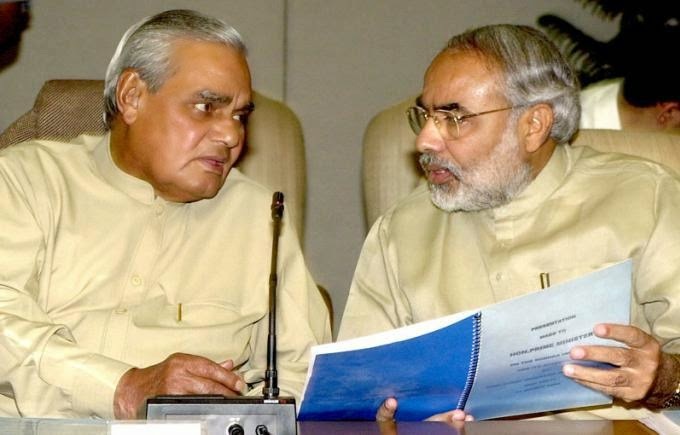 When asked what advice he had for the CM (Narendra Modi), Vajpayee says that the CM should follow "Rajdharma" which means looking after the people he is governing irrespective of caste, creed, religion etc. without any discrimination. Why would Vajpayee make such a statement? I think it was because he believed that Modi did not follow "Rajdharma". As PM of the country, he was privy to a lot of information that the public does not know and he knew the ground realities and what actually happened. He then made this remark. I really don't need any more proof for Modi's guilt at not doing enough. Modi sheepishly smiles through the remark and then adds, "Hum bhi to wahi kar rahe hain, sa'ab!" Vajpayee then says that he believes that Modi is doing this as well. Modi devotees have used this last line of Vajpayee to say that he endorsed Modi's actions during the riots. To me at least, it is obvious that he said the last line merely as a face saver to Modi. Modi kind of told him, "Boss, please don't strip me in public like this!" And Vajpayee left his undies on him. Again, vote for Modi if you wish. But don't say he did all he could to prevent the riots. Modi could have prevented the riots from happening. He did not. Period. Hindsight is a very good friend of everyone. It makes even amateur look & talk like experts full of wisdom. Example of hindsight: "Modi could have prevented the riots from happening. He did not. Period." Majority of people in this country have realized this selective bias of a section of the society very clearly, and hence they are rallying behind Modi this time. They are tired of hypocrisy. Tired of sections of people who still want to latch onto the past with whatever fig leaves that they can get hold on to.. and in the process being blind to the truth that is presented before their eyes.. by the Supreme Court. All the Best to them & their believes. The good thing is that this section of people are not in a minority. The very fact that people are still trying to dig up videos which are 12 years old.. and those that have been played repeatedly over 7 over again.. makes it amply clear that they have nothing new to add. "Why I & many others like me support Narendra Modi"
Who's responsibility is to control Law and Order. Is it not of the Govt. primary responsibility? He could not control in his own state, what can he think of Centre.